Happy Friday. Generate will be taking Monday off. Have a nice holiday weekend! Tomorrow marks the birthday of the late Levon Helm, so this richly told story is today's intro tune . . . It's happening: per Reuters, "Russian Energy Minister Alexander Novak has had talks with Saudi Energy Minister Khalid al-Falih on an easing of the terms of the global oil supply pact that has been in place for 17 months, Novak said on Friday." Why it matters: the comments signal how a swirl of forces — notably Venezuela's collapsing production and the revived U.S. sanctions against Iran — are prompting Russia and OPEC to weigh changes in their output-limiting agreement. What's on the table: Reuters and the Financial Times, citing anonymous sources, say discussions are exploring a combined output boost of around one million barrels per day. What's going on in the market: prices have been sliding recently in anticipation of more supplies hitting the market. The global benchmark Brent crude, which has touched $80 per barrel in trading earlier this month, has fallen into the $77 range this morning. What's next: all eyes will be on the OPEC meeting in Vienna next month, where ministers from the cartel and allied producers will discuss the output-limiting deal that's currently slated to run through the end of 2018. 2018 ladies and gentlemen: Reuters reports from Russia this morning . . .
"OPEC began a discussion about easing production cuts following a critical tweet from U.S. President Donald Trump, OPEC’s Secretary General Mohammad Barkindo said on Friday." Amy Harder reports . . .
Shareholders at almost two dozen energy companies have pushed for resolutions urging more disclosure around climate change over the past two years, with most firms either releasing, or committing to release, reports on the topic. The details: The resolutions in the chart above call on companies to issue reports assessing how their businesses would fare in a world that cuts greenhouse gas emissions to amounts roughly in line with the aspirations of the 2015 Paris climate agreement. Go deeper in the Axios stream. 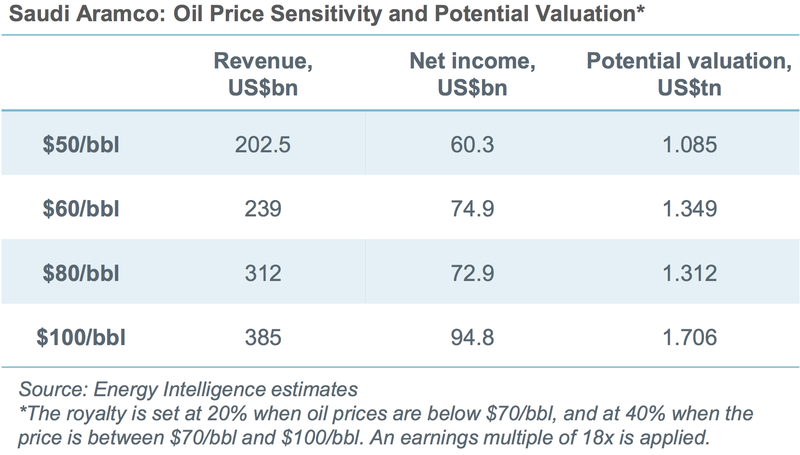 New analysis: The consulting arm of Energy Intelligence is out with a new look at the finances of Saudi state oil giant Aramco (with an assist from leaked data Bloomberg obtained). It estimates the company's value, based on current prices and production levels, at $1.3 trillion. That's well below the $2 trillion valuation the kingdom has hoped for as it prepares for its IPO. But it's "perhaps enough to satisfy skeptics at home," states a summary of the analysis. It notes that even oil at $100 per barrel would not achieve the $2 trillion target. Why it matters: Saudi officials hope to raise tens of billions of dollars through an IPO of a small portion of the company. But those plans are shrouded in uncertainty about when it will happen — and whether a portion will occur on a major international exchange at all, or just on the relatively small Saudi exchange. New political volley: the Democratic Senatorial Campaign Committee is running an ad on Twitter starting today and through the holiday weekend that seeks to blame Republicans for rising gasoline prices. Why it matters: the brief ad signals how prices at the pump, which have risen alongside the oil price rebound, are seeping into election year politics. It arrives amid a broader effort by Democrats to link Republicans and President Trump to higher consumer costs. Standing caveat: presidents have a pretty limited influence on the price of gasoline, which is largely based on crude prices set on global markets. But that said, policy decisions like reimposing Iran sanctions affect the oil price. New legal developments: per the Wall Street Journal, a federal judge is asking for more information from several of the world's largest oil companies ahead of a decision on their bid to dismiss lawsuits over global warming. DOE budget: per The Washington Examiner, "The Senate Appropriations Committee easily advanced its Energy-Water fiscal 2019 spending bill on Thursday, rejecting Trump administration efforts to reduce funding for energy and science research." Vacancy filled: Yesterday the Senate unanimously confirmed Francis Fannon — a former oil executive and Capitol Hill aide — to be the assistant secretary of State for energy resources. Why it matters: The Trump administration is short staffed as it seeks to work with other countries on the implementation of revived U.S. sanctions against Iran. The Trump administration, like its predecessor, is also keen to use U.S. energy resources including increased LNG exports as a diplomatic lever. ICYMI: yesterday in Copenhagen the Energy Department announced the launch of an alliance with eight other countries aimed at bolstering nuclear power and promoting it as a tool to fight climate change. Why it matters: The announcement at an energy summit in Denmark comes as nuclear power faces headwinds in the U.S. and elsewhere, despite the need for zero-carbon electricity sources to help meet challenging international climate goals. The most recent forecasts from the federal Energy Information Administration project modest global nuclear generation growth of 1.5% annually through 2040. China and India, in particular, are expected to see significant increases while U.S. output is slated to drop as plants retire. A little more: per DOE, as of yesterday the proposed coalition that Energy Secretary Perry proposed last year was taking "full effect." This blog post from deputy energy secretary Dan Brouillette lays out some focus areas. Trendspotting: "The world market for corporate sourcing of renewables in 2017 reached about 465 terawatt-hours, placing it close to France’s overall electricity demand," states a new report from the International Renewable Energy Agency. Why it matters: it's the intergovernmental group's first attempt to tally the scope of various kinds of corporate agreements to purchase renewable electricity worldwide. "Corporate sourcing of renewables has the potential to drive significant additional investment in renewable energy," it states. The report says there's currently activity in over 75 countries "even though most governments are yet to adopt specific policies to encourage such demand."